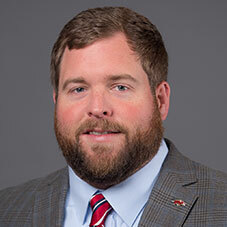 Fry joins the Razorback staff after spending three seasons at SMU (2015-17) as offensive line coach. Prior to his stint in Dallas, he served as an offensive graduate assistant at Clemson from 2012-14. At SMU, Fry’s offensive line cleared paths for a 1,000-yard rusher in both 2016 and 2017. His 2017 unit blocked for the Mustangs’ offense to produce 3,000-plus passing yards and 2,000-plus rushing yards. The Mustangs averaged 5.0 yards per carry and were one of 18 FBS programs, including one of three in the American Athletic Conference, to accomplish that feat during the regular season. SMU’s 2,230 rushing yards were its most in a regular season in 10 years. According to Sport Source Analytics, Fry’s offensive line in 2017 ranked No. 14 nationally in efficiency (79.6), based on tackle for loss percentage, sack percentage and third and fourth down run percentage. In his three years at Clemson, he helped the Tigers to a 31-7 record with two top-10 finishes. He was a player development coach with the offensive line and helped center Dalton Freeman earn first-team All-America honors in 2012. Fry lettered four years with Clemson and was a first-team All-ACC center and a National Strength and Conditioning Association (NSCA) All-American on the 2006 offense that averaged a school-record 6.5 yards per play. He played in the Senior Bowl and was a fifth-round draft pick of the Rams, playing for St. Louis in 2007 and 2008. He also spent time with the Cleveland Browns, Denver Broncos and Carolina Panthers.